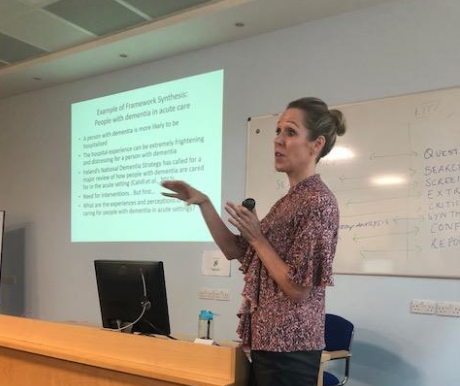 An Evidence Synthesis Workshop was hosted within the School of Nursing and Midwifery at NUI Galway on Friday, 21 September. The aim was to provide to an introduction to systematic reviews and Qualitative Evidence Synthesis (QES) to staff within the School. Bernard McCarthy gave an overview of systematic review methodology. Dr Catherine Houghton, QUESTS Co-Chair and lecturer within the School, gave an overview of QES. Due to interest in the sessions, the School is running a follow-up workshop in December. Dr Houghton was invited to provide an introduction to QES because of her experience on a number of QES projects, including two syntheses led by CHErIsH study researchers Dr Karen Matvienko-Sikar and Dr Elaine Toomey, a Cochrane Review which aims to investigate factors that impact on recruitment to randomised trials in health care, a QES of experiences and perceptions of personhood for people living with dementia, among others.